REBVG reports sales have dropped 32% compared to 12 months ago, the lowest levels in more than 3 decades. Sales were 46.3% below the March sales average and the average price down to $1.43 million. After agonizing conditions for the last year, it doesn’t look like anything will help homebuyers get their desired homes or help sellers get their desired price. Listings have increased an unbelievable 52% since last year, but it doesn’t matter to homebuyers who don’t want or still can’t afford to buy anything now. 800 less homes were sold! For all property types, sales to listing ratios were 13.5% which is just above recession sales averages. There are slightly less than 5000 single detached homes, condos and apartments for sale in Greater Vancouver. Sales to listing ratios remain at brual lows for a city that’s so desireable to live or vacation in. Home prices however, only dropped half a percent from last month. What will Horgan do for the next .5% decrease? The anti-business lobby might appeal to some, but over years the lack of housing development begins to cause significant pain for everyone — renters, businesses, and for government taxes. In fact, this can cripple BC prosperity at a critical time and leave scars for years. What the greedy BC government’s oppressive policies actually achieve is creating a place where investment and development is impossible, prices reach ever higher, and no one can afford to live. How long can BC voters continue to vote for this? Common sense tells BC voters they made a big mistake, and now it’s pay back time. In order for BC’s economy to keep the status quo or progress, prices must moderate and availability grow. That’s simply not happening. The elected BC premier has done nothing to encourage developers and investors to contribute to building new housing in Vancouver. The local media is eager to let Horgan and his NIMBY fan club escape responsibility for this mess and for not correcting the ICBC insurance scam. There is only one remedy — more housing — meaning Horgan must be replaced with a pro-business, pro-housing, pro-future Premier. Horgan is playing on renter’s immediate desperation for living space (and BC rents are out of control due to lack of apartment development). It’s a farce that BC businesses can’t find workers because there’s nowhere for them to live. This is what socialist policies do. His claim that speculator profits are to blame is laughable. Speculators are not in Vancouver, let alone bathing in money. REBGV believes the flat sales and decrease in prices of late are due to rising interest rates and mortgage stress test rules. Truth is, they’re being nice to Horgan and not telling like it is. Once a downturn happens, Horgan will look foolish blocking investment (and Alberta oil). Anti-business always policies lead to disaster. This is characteristic of almost all Canadian housing markets at present. Toronto, Calgary and Mississauga have all plunged. Montreal on the other hand, has done well without regulation. It’s disgraceful what’s happening in BC, and there’s no need for all this suffering. Bad people need to be removed and pro-business people brought in. While sales plummet, prices aren’t. Come on Vancouver voters, it’s time to let investors back in. Find out who the evil ones behind the scenes are pushing this madness, and get this fixed. It’s up to you. Home listings continue to grow and sales continue to fall across the greater Vancouver housing market to the lowest levels since the great recession. A total of 3976 properties were listed for sale in March on the MLS (up approx 30% from last month). Sellers are dumping their homes onto the market, but the price slide just won’t happen — too much demand. Only a recession (USMCA conflict) would crash the market. 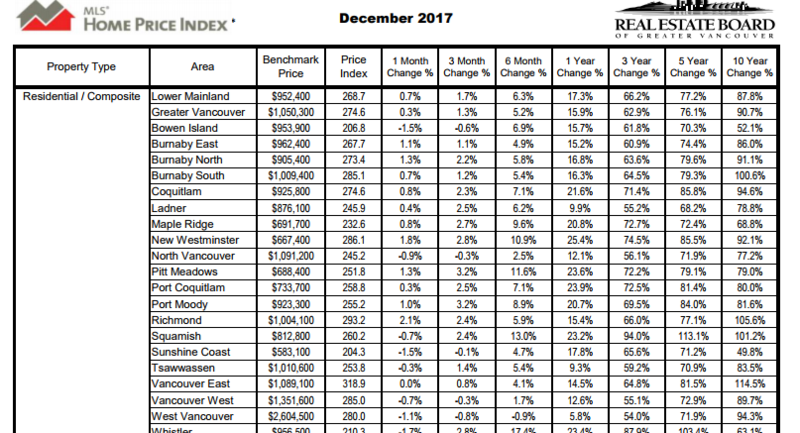 The biggest drops in price of all type of homes were in Burnaby East (-1.1%), Burnaby South (-1.1%), Coquitlam (-1.1%), Port Coquitlam (-1.5%) and Tsawsassen (-2.5%). The biggest increase in home listings were in North Vancouver, West Vancouver, and Richmond. CREA just released the BC housing market report . There were 3,546 residential sales on the MLS® system in January. That’s a crash level drop of 33.2% from last January. The average MLS® residential price in British Columbia was $665,590, down 7.7% from one year ago. Total sales dollar volume dropped 38.5 % to $2.36 billion from last January. Cameron Muir, BCREA Chief Economist suggests the Fed is to blame, with market trashing mortgage qualification rules. Other factors to note though are a socialist BC government, reduced China Trade, mortgage rates that were trending up, and trade uncertainty with the US. Collectively, BC buyers got the message that buying homes was not a good idea. Chilliwack, Vancouver, and South Okanagan saw the biggest drops in sales from 40 to 50% down from last January. BCREA forecasts improving sales in 2019 after falling 23% this year. So far sales have only dropped. The 10 year average sales is 84,000 units and they’re expecting 89,500 transactions. However Cameron Muir, chief economist, says mortgage stress tests and rising interest rates are a drag on the economy. He mentions in the latest report, that favourable demographics and strong economic performance are keys to sales growth. The elephant in the room is the disappearance of China to US goods flow, and we’ll discover how important that is in the next few months. BCREAS’s recent report show new construction numbers are high which sets us a risky situation if the economy fails. Where is the Vancouver Housing Market Headed in 2019? The loss of the China to US free trade business is more worrying than many anticipate. Less container traffic, less related import business, along with BC’s isolation in relation to the US markets will impact BC’s economy. And when will the best time to buy a house be? The lull in the US economy is one reason price pressure has eased in Vancouver’s housing sector. As the US Fed raises its rates, Canadian interest and mortgage rates will rise a little by July. Vancouver’s surprisingly low unemployment rate continues at 4.4%. Investment in housing however is dropping as builders grow pessimistic about BC’s future. Of course, if the US can keep its ship on course, the economy will stay strong and Vancouver home prices will rise once again. The question is, when will prices begin to rise in 2019? Why? US economy will be weaker in first 3 months of 2019, Canadian regulators want higher mortgage rates and to suppress Heloc usage, and increasing stress test qualifications. And home and condo sales are trending down strongly (10 year low, inventories 6 year high). Momentum and expectations are for lower prices. Vancouver’s economy perked up in September but fell back to earth in October. Home sales and prices fell again too, down 35% since last fall. Buying in Vancouver? Keep your eye on the big picture and key economic events and see which neighborhoods are going to drop in price the most. West Vancouver, North Vancouver, Burnaby, Port Moody, North and Port Coquitlam, appear to be the most vulnerable. US companies imported like crazy before the Jan 1st US tariff deadline, and that means they’ll be importing much less in the first 3 months of 2019. This will hit BC exports. Canada’s battle with China will further impede International business and China dependent companies in BC could be in for a rough ride. That give more buyers pause for thought before buying at million dollar prices. Next summer, the US will heat up. 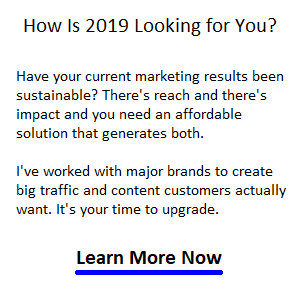 Find an agent now. Be prepared for this temporary opportunity. Canada’s underperforming economy will continue to be torchered much like BCs housing situation for many years. The energy sector is dead, killing the Calgary housing market and that will raise Federal taxes. A low loonie will make precious Vancouver real estate very attractive. With foreign buyers subdued, Canadians might have their golden opportunity in perhaps what is the best city in the world (safety, education, employment, lifestyle recreation). Before you buy, make sure you know when is the best time to buy a house, and if you’re selling, ensure you’ll selling your house for the highest price. Get to know the Vancouver market. Does this make Vancouver a good place to buy a home? The answer has to be yes. Whether it’s free trade or Trump protectionism, Vancouver comes out okay. The question of housing affordability is similar. Suppy never increases. Sales to active listings ratio for single detached homes reached a depression level of 6.8% in Vancouver. What happened in July of 2016? The Foreign Buyers Tax. Home prices dropped $200,000. Yet BC still has the lowest unemployment rate in Canada, (4.2 % in October after 2% growth in September, +33,000 jobs) well ahead of Toronto. Wages could rise giving more impetus to the housing market. However, is this a last (get stuff into the US quick) uptick before the US China tariffs take effect on January 1st? The announcement of the $40 billion LNG project is a big booster shot for BC with thousands of jobs to be created. The added investment will give the housing market in Vancouver a little boost and perhaps encourage more new construction. See the full running Vancouver housing market report below. The housing forecast from CMHC isn’t so optimistic. The CMHC forecast said their were 40,000 new home construction starts this year but they will fall to 2015 levels by the end of 2020. A good portion of 2018 sales numbers come from people migrating to the Okanagan. With a flagging economy that should cease. However, as the US economy revives next summer, BC’s economic forecast should improve thus maintaining upward pressure on home prices. Greater Vancouver had a lot going for it and as demand grew from the overheating US economy. Yet in in early 2019, US demand will weaken. The BC economic department cites big growth in natural gas, timber, agriculture, manufacturing, services, and that value was focused directly on the GVA. Housing affordability enthusiasts and homebuyers (hoping for a crash) are left with an empty feeling as homes retain their prices amidst continuous political rhetoric. We don’t want to mention Toronto, however the Toronto housing market looks to be following Vancouver’s turbulent path. As long as the loonie stays low (CAD US Conversion rate), the Vancouver and Toronto economies will be okay. Of course, this may be why there’s no pipelines leading out of Alberta. Housing supply and NIMBY resistance are the key issues no one is willing to tackle. Do you feel the BC government’s $6 Billion plan announced last year is working to increase investment, lower prices and build affordable housing and alleviate homelessness? Are speculators and tax evaders really causing the problem? Or, is this smoke screen buying the NDP some time? US President Trump doesn’t like Trudeau and will not do permanent deals with him. Trump will likely update the USAMC agreement with Andrew Scheer, when he’s elected prime minister next year. Trudeau is holding is own Trade meetings without inviting the US, but so far no one has accepted. Trudeau is exploring trade with China, which is in the midst of its own housing and economic meltdown. After the recent China spy chip revelation, this is not the time to to approach China. The situation looks hopeless for Trudeau. According to REBGV, demand for homes fell in September, down a scary 43.5% from last September and down 17.3% from last month. That’s down 36.1% from the September historic average, a trend continued in October. The number of home listings rose 10.7% from August and up 38.2% from last September. 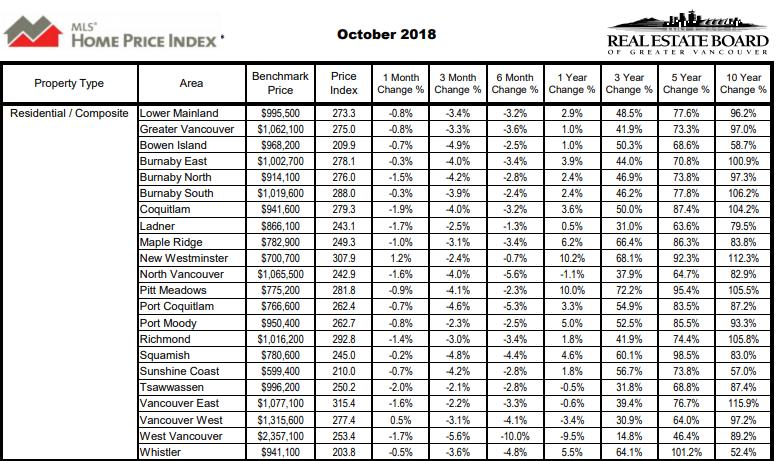 This is a huge change and yet Vancouver home prices fell only 3% from August 2018, and yet were still up 2.2% from September 2017. Sales of detached properties in September fell 344 units, a 40.4% drop from last September’s sales of 852 units. Apartment sales dropped to 851 units (down 44% from last Septembers total of 1451 units). Attached property sales volumes decreased 46.9% in September to a paltry 275 units, from 518 sales in September 2017. This chart courtesy of Terranet, shows Vancouver is clearly beyond anything in Canada (orange line at top) and is only seeing a leveling off of prices. 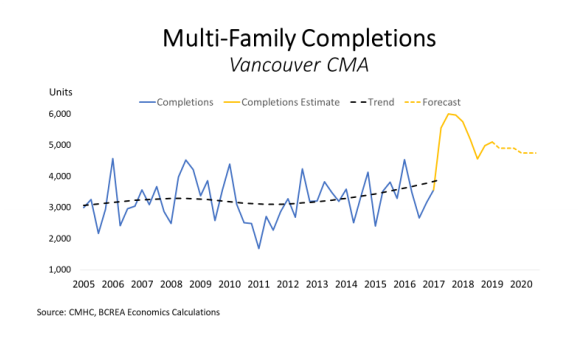 Overall, new construction starts trended downward across Canada and its up slightly in greater Vancouver — the equivalent of a couple of buildings in a city of almost 2.5 million. Across the country, there were 219,988 units started in July 2018, compared to 221,738 housing starts in June 2018. In Vancouver, in August, there were 297 permits to build 852 residential units. That’s a slight increase over the 279 permits issued to build 346 units in July 2018. 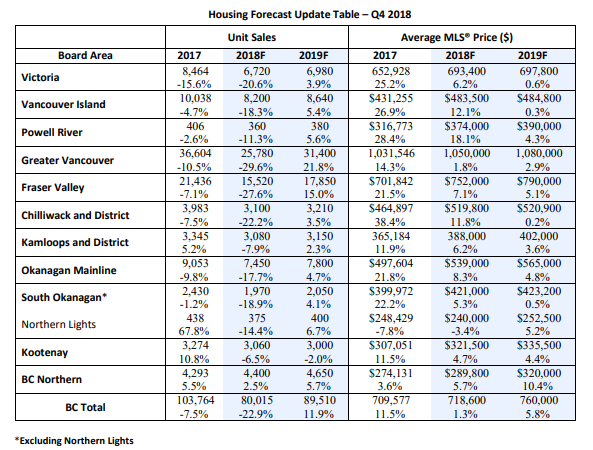 Growth during the summer: The Star Vancouver quotes CMHC as saying 14,719 new housing units were on sale in the Metro Vancouver market so far in 2018. That’s compared to 14671 this time last year. Rental housing was going strong too. Almost 3,890 units of rental housing were built in 2018, about 35% more than at this date in 2017. All this inventory comes at a time when buyers are disappearing and more likely will leave the overpriced market facing an economic fallback. Just as in the Toronto real estate market, the condo market is where the focus is. That’s due to high home prices and the fed’s new stress test mortgage rules. Moody, Port Coquitlam, Coquitlam, Pitt Meadows, Maple Ridge, and South Delta. Burnaby, Squamish, and West Vancouver suffered the largest monthly drops in house prices. 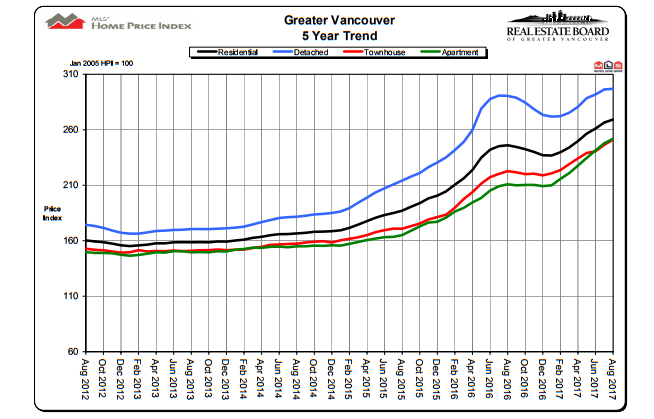 As this chart from REBGV shows, home prices are still way up from years past. However, it gives us pause for thought about how much they could potentially fall. Are you looking for good opportunities for rental income property? Or just wondering when the best time to sell your home in greater Vancouver? Take a look at the best best renovation ideas and plan your selling strategy. The Vancouver housing market is reflective of a strong BC and Canadian economy and the outlook for spring 2018 is positive too. As the King of unaffordability, Vancouver is suffering from a crushed housing market, big immigration, increased global trade, growing poverty and stagnant wages. The monthly stats send the same message each time. This same situation exists in the Toronto housing market which is enjoying a stronger fall season as well. In fact, a few are sensing the beginnings of continued housing boom after a weak late winter 2018 season. The Real Estate Board of Greater Vancouver (REBGV) reported that sales of detached, attached and apartment properties reached 35,993 on the Multiple Listing Service® (MLS®) in 2017, a 9.9% decrease from the 39,943 sales recorded in 2016, and a 15% decrease over the 42,326 residential sales in 2015. — from GVREB 2017 Year Report. Vancouver remains perhaps the most unaffordable city in North America based on home price vs income. And with new mortgage rules Vancouverites have found themselves not much better off. Ask any post secondary student about housing. However, it’s expected that new investment will pour into student hotel housing projects. Please do use this report on Facebook or your Newsletter. Why do all the work yourself? It could be BC voters have learned that despite terribly high prices, the BC economy is more important. And the formerly strong Canadian economic forecast is now in doubt. The sad part is that housing affordability remains a big problem in Greater Vancouver. The solution is big investment in housing not in meddlesome government actions. Politicians might be able to do less than ever now. It would be difficult to rationalize lower prices given a strong, growing economy and a lack of housing in Vancouver. Demand for places to live and for investment properties is being funneled into the Greater Vancouver condominium market. As of the first half of this year, HPO had received registrations for 1,788 new Vancouver condos, down from 2,488 units at the same time in 2016 — from a report in the Vancouver Sun. Homes for sale scarcity combined with eager buyers, means demand is being focused on condos, townhouses and apartments. 3043 property sales were recorded in August 2017 which was 2.3% increase over July’s numbers. And it represented a 22% increase over August 2016 sales. While sales of detached homes dropped in August 2017 compared to July sales, and compared to August 2016 sales, Vancouver condos are in hot demand. More than 4200 condos and townhouses were listed for sale in August. The decreased availability and rising prices are putting big pressure on International students studying in Vancouver. UBC has 6000 students on their housing waitlist. Huge investment opportunity in foreign student housing. Are you an investor? The August 2017 sales report shows townhouse/condo/apartment prices are rising fastest in Pitt Meadows, Squamish, Port Coquitlam, Burnaby East and Whistler. Mapleridge saw a big increase in apartment prices likely because the average price is only $252,000. Check out the Calgary housing forecast and the Toronto housing Market for comparison. Vancouver is host to tens of thousands of foreign students studying here, and they have an impact on condo prices. Currently companies such as CIBT specialize in student housing investment. They purchase properties such as hotels to fill this big demand in a Vancouver housing market that is near to a zero vacancy rate. Check out the student housing investment opportunity yourself. The forecast here is for more demand. Here’s a look at the historical price trends in Vancouver contrasted with Toronto prices. You can see the Toronto real estate forecast here. The Real Estate Board of Greater Vancouver (REBGV) reports that residential property sales in Metro Vancouver totalled 2,489 in August 2016, a decline of 26 per cent compared to the 3,362 sales in August 2015; 10.2% fewer than the 2,771 sales in August 2014; and 1% less than the 2,514 sales in August 2013. August 2016 sales also represent a 22.8% decline compared to last month’s sales. – From the latest market report from REBGV on Sept 2, 2016. The forecast is for fewer sales and perhaps lower prices, yet because of the foreign buyers tax, it might look more precipitous right now than it actually will be. 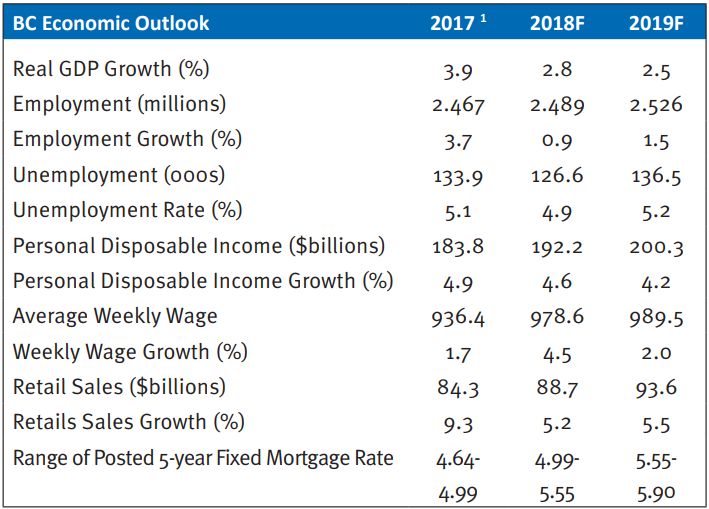 BCREA has offered a renewed look at the BC economic outlook. If free trade and NAFTA is cancelled from the Americans, these numbers might be much too rosy. Mortgage rates on the other hand may rise as the Fed raises interest rates to serve its own needs. 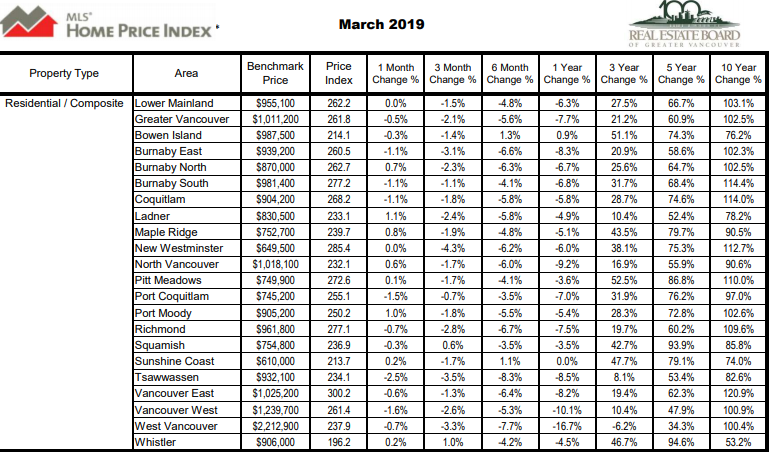 BC lower mainland real estate was doing well, in stark contrast with Northern BC which saw its sales volume drop 8% and total sales volume drop by 25% compared to January 2015. It will be much worse in August and September. The Greater Vancouver area saw its sales volume rise 73% to $2,788,099,000. That was actually overshadowed by the 101% rise in sales volume in the Fraser Valley year over year in January. The valley had a growth of $427 Million. Chilliwack and Powell River saw significant gains too, as affordability issues are forcing more BC residents out into the burbs. 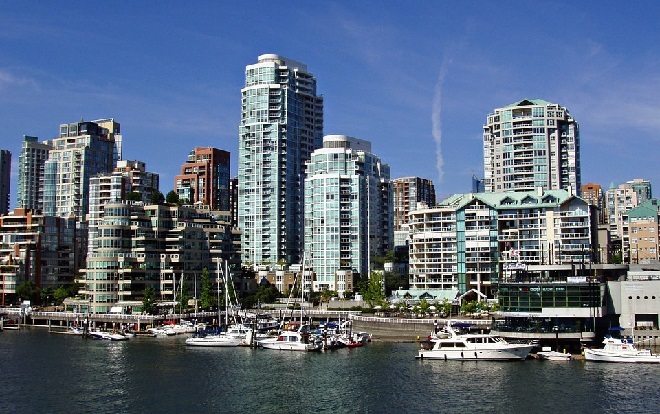 The condo market in Vancouver showed a shocking increase of 50% year over year. What it means for BC is a rare moment of sunshine where it is leading Canada in prosperity. Add that to BC’s more progressive and optimistic culture, and you’ve got an exciting mix. We can only hope it will last for a few more years before the Conservative wet blanket kills the party. Vancouver Island enjoyed 50% growth in sales volume and the city of Victoria grew in sales to $260 Million in January. 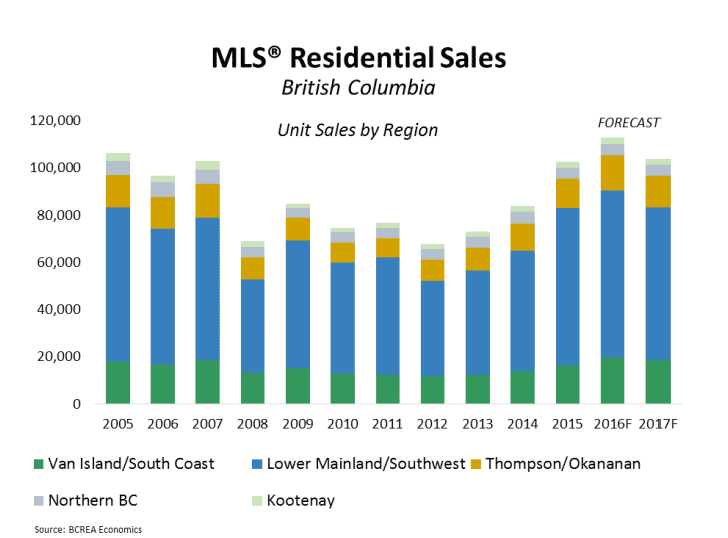 The south Okanagan region had a surprising growth of 44% in sales volume as well. It’s hard to argue that the Okanagan has not benefited from real estate and migration. Now it’s fall of 2018 and we wonder how you feel about BC government leaders actions and whether they were wise? This winter, we’ll know. Yet, this market isn’t the hottest on record for BC, which was even more heated in 2005, before the crash of 2007. Should this non-record high real estate market be snuffed out? While politicians were jumping to suppress sales in BC, no one can argue that the deluge of real estate investment money created unheard of opportunity in Vancouver. The province is drawing migrants from Alberta and Saskatchewan who are looking for jobs at a time when Alberta is facing its biggest crisis ever. The worst hasn’t even hit Alberta yet, as oil sunk to touch $25 a barrel last week. BCREA is the professional association for over 19,000 REALTORS® in British Columbia Canada. BCREA focuses on provincial issues that impact real estate. Working with the province’s 11 real estate boards, BCREA provides continuing professional education, advocacy, economic research and standard forms to help REALTORS® provide value for their clients. REBGV is The Real Estate Board of Greater Vancouver, a member-based association of more than 14,000 REALTORS® who live and work in the Vancouver region. The Canadian Real Estate Association (CREA) is one of Canada’s largest single-industry trade Associations. It’s membership includes more than 125,000 real estate brokers, agents and salespeople, working through 90 real estate Boards and Associations across Canada.